Kenny Jackett believes the fervour of Rotherham United fans could be a key weapon in the club’s battle to stay in the Championship. Jackett took the hot-seat late last month, with the Millers bottom of the table and supporters disaffected by the reign of Alan Stubbs who was sacked after one win in 13 league games. And the new manager is calling on his side to produce the type of displays at New York Stadium which will have followers in full voice again. 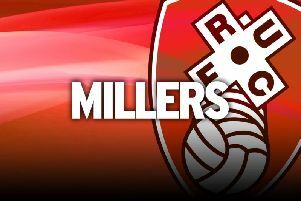 Rotherham lost 3-1 at home to Preston North End in the final match before the international break, but have generally shown a significant improvement since the former Wolves boss assumed control. Meanwhile, Stubbs is hoping prospective employers focus on his time in charge at Hibs rather than his short spell in South Yorkshire as he seeks to return to management. Stubbs and his backroom team of John Doolan and Andy Holden lasted only four and a half months with Rotherham but, before that, won the Scottish FA Cup and reached the Scottish Championship play-offs during two years north of the border. “When you look back, we didn’t do too bad at Hibs,” he told the Edinburgh Evening News. “The second job just didn’t materialise the way we wanted it to. “I’ve done well at one club and at another club, after 13 games ... I’m not going to say anything bad about the club - you draw a line under it and move on. “I’d like to think people would be able to look at my overall body of work rather than just the last 13 games. “Things can work out differently at different clubs. Rotherham’s a club where a lot of managers have come and gone. It’s a tough job in terms of competing against the other teams in that league. “I didn’t want to get sacked so early, obviously, but whether it was right or wrong, people will always have different opinions. “What’s happened has happened but me and my staff will move on. We’ll get another opportunity and we’ll go again. It’s not dented my enthusiasm. Stubbs has taken a holiday since his Millers departure and is now open to offers. “Then it’s just a case of waiting for an opportunity to come. I’m open-minded about where I go next. Me and my staff still fully believe in our ability and still feel that we can do a really good job. “I’m really positive about the next job and what that could entail. If we feel it’s the right opportunity and an exciting project, then it’s something we’ll look to pursue, but it’s important that we don’t just jump into the first thing that comes along unless we’re sure it’s the right thing.